Every four years, two children disappear from Gavaldon village. 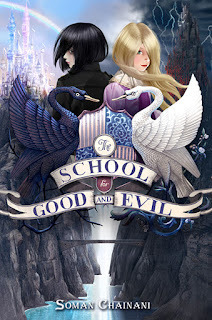 According to legend, one goes to the School for Good to become a fairytale hero, the other to the School for Evil where they turn into a villain. Beautiful Sophie is desperate to be chosen for the School for Good, while crotchety Agatha seems a natural fit for the School for Evil. Both girls are picked - but they're put in the wrong schools. Aren't they? That said, it's not without its flaws. For a start, it's about 50% longer than it needs to be. Much of the book is fairly repetitive and at not far short of 500 pages it seems to overstay its welcome somewhat. Despite this, it's also got an ending which seems somewhat rushed. On the plus side, though, it's a clever conclusion which brings a real sense of closure to this adventure - and when I seem to spend a fair amount of time complaining about endings which aren't remotely satisfying, it's nice to be able to give a book credit for knowing the perfect place to stop. Not quite as good as I was expecting it to be after the world-building got me hooked quickly, but it's still definitely worth a read if you're looking for a clever, funny fantasy tale. I'll certainly be on board for the next book in the trilogy! Oh, one last thing - I love the cover; one of my favourites of the year so far. The manga-style characters capture both of the leads perfectly! Mmmm, when a book drags on TOO long, sometimes I lose interest a bit, though usually I'll finish it. I admittedly haven't read much about this one, but the premise is brilliant! And a love triangle you didn't mind? NICE!